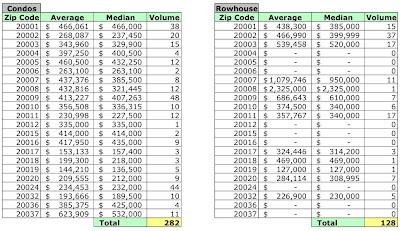 I've [finally] finished my analysis of full value residential sales the District recorded in March 2008. One change I've made this month is to show each housing category's share of the month's dollar volume. I did this to identify categories that may be having an impact on average prices far beyond their share of sales volume. Thirty one houses each sold for more than $1MM. That's 13.25% of all houses [rowhouses, semi- and detached] sold. Those 31 houses, at a total dollar volume of $49,756,530, were 34.88% of the dollar volume for houses. Excluding these 31 houses from the analysis lowers the average sales price for a house by 24.57%, to $459,704. In fact, those 31 houses - 6.01% of all sales recorded in March - represent 20.5% of the District's dollar volume for the month. Excluding them from the analysis lowers the aggregate average sales price 15.3%, to $398,437 [vice $470,155]. All but two of those houses were purchased in Wards 2 and 3. 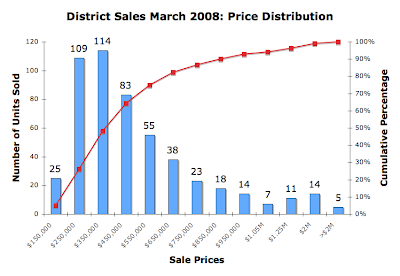 In March 2008 the District recorded 516 residential sales. Although detached homes represented 13.18% of units sold, they comprised more than 25% of the month's dollar volume. Only one ward, Ward 6 had higher sales volume. Wards 3 and 8 had positive growth in prices; Wards 1, 4 - 7 were negative; Ward 2 split the difference. Ward 7 had the steepest drop in sales volume, down almost 58%. Condo sales dominated sales in Wards 1, 2, and 6. 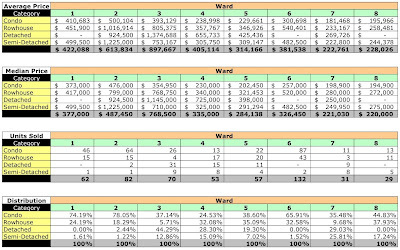 In Ward 1, 74.19% of sales were condos; Ward 2, 78.05%; and in Ward 6, 65.91%. As in February, Ward 6 accounted for the most condo sales in the District, 30.85%, followed by Ward 2 at 22.7%. The chart below shows the distribution of March's recorded sales by sales price. In the aggregate, average prices were down 8.56% and median prices fell 8.78%. The slump in sales volume continued, spiraling down 35.09%; condos fell 36.49% and homes declined 33.33%. Overall, dollar volume plummeted 40.65%; it was worse for condos, down 49.81% YoY. Overall demand for single family housing is down 33.33%. Average prices were up 2.1% and median prices were down 4.55%. All categories of houses had lower sales volume YoY. 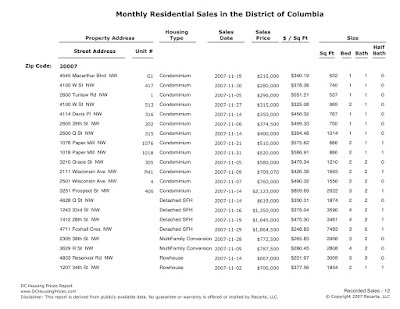 Note: I use the District's downloadable appraisal data to calculate sales price per square foot. This data usually have a 6-12 month lag, or worse, meaning that typically the data don't include condos or homes completed within the past year. Data may not be available for all properties. My analysis is dependent upon the completeness and fidelity of the District's appraisal data. 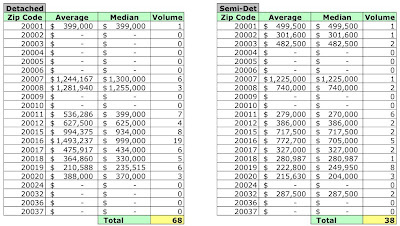 March 2008 average and median sales prices and unit volume by zip code. 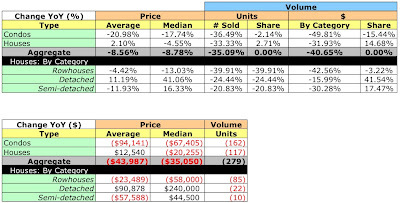 March average and median sales prices and unit volume by ward.